Per S.B. 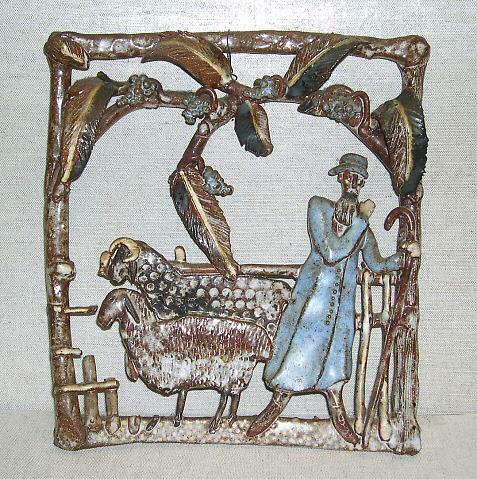 - Plaque; stoneware, with blue and white glazes. Freely handbuilt with open spaces. Piece depicts a scene in a rectangular frame. A bearded man with staff appears with two wooly sheep, one with curved horns. They are inside a fence and arbor twined with grapes and berries. There do not seem to be biblical connotations. Sheep of this breed were at Pond Farm when Wildenhain arrived there. According to Forrest Merril, an avid Wildenhain collector, Wildenhain made pieces like this during her first ten years in California. They may be related to Wildenhain's Bauhaus days in Germany, when the community made dough figures at holiday time.